Why walk on fire? Fire walking is a powerful experience. 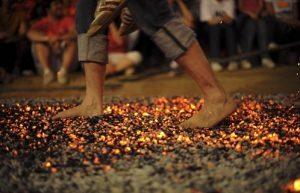 Walking barefoot over hot glowing coals is a unique and exciting way to challenge yourself to overcome limiting beliefs and act in the face of fear. It is also a beautiful way to develop a deeper connection with the element and energy of fire. It is a teacher for performance, career, practice, and purpose. The practice of fire walking can be found in recorded histories from centuries ago. The ancient Romans, Brahmin priests from India, African tribes and Bali initiations all have recorded using fire walking in ceremonies for healing or other spiritual experiences. Fire walking experiences have been documented in Argentina, Australia, Brazil, Bulgaria, Burma, China, Egypt, Fiji, Greece, Haiti, Hawaii, India, Indonesia, Japan, Malaysia, New Zealand, Pakistan, the Philippines, Singapore, Spain, Sri Lanka, Thailand, Tibet, Trinidad, and South Africa. Jeri and Sandy, have been leading people across the coals for over ten years. They trained with Tolly Burkan, the leader of the fire walking movement in this country, in firewalking, glass walking and arrow breaks. Since that time, they have held numerous workshops using the practice of fire walking to help people step into their potential. Jeri and Sandy use these workshops to help people connect to their own personal sense of power. Some see this exercise as a greater connection to God, others see this opportunity as a better understanding of their own intuition or personal power. In any case, fire walking gives you an opportunity to face your fears and overcome them. It also gives you a very tangible way to realize and more fully use the power within. For more information, contact Jeri LaVigne at: jeri.lavigne@comcast.net or 678-886-5996 or Tracey at 251-680-4413.